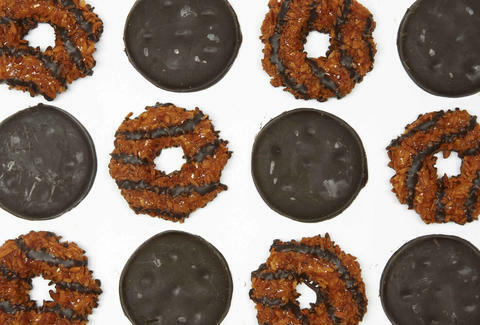 You can now buy Girl Scout Cookies online. This is not a drill. For far too long, we've had to interact with an actual person to get our annual supply of Thin Mints and Samoas. And while our coworker's niece is a perfectly nice saleswoman, she can fall behind on deliveries, and also we're pretty sure we detected a judgmental tone when she read back our last total. Well a brand-new dawn is upon us, dear friends, because for the first time in history, the Girl Scouts are selling cookies online. Though the Girl Scouts of the USA have historically been very much against web sales -- they've basically ordered cease-and-desists on Brownies who've tried in the past -- they're looking to embrace the Internet this January, when the new "Digital Cookie" platform launches nationwide. The system will set each Girl Scout up with her own sales webpage, which she can then customize and invite people to via emailed invites. The girls can also direct customers to a mobile app for phones and tablets, but no matter which option you choose, the cookies are coming right to your door. That's right: Digital Cookie is offering direct shipping, giving you just one more excuse to never leave your house. If you live in one of the select promised lands that's already selling Girl Scout Cookies, the program might already be at your disposal. The rest of us will have to wait until the official start of cookie season (January 2015) to test it out, but thankfully, we're only one month away from this exciting new chapter in American history. Kristin Hunt is a Food/Drink staff writer for Thrillist, and wonders if she can score Prime shipping on the ungodly amount of cookies she plans to buy. Follow her at @kristin_hunt.